BSNL will be first in the race to launch 5G services in India. Telecom company has been working on its 5G services for a long period of time, and is expected to roll out the next-generation ultra-high-speed telecom services soon. and a global launch together; which means that they will be the first to launch such services in India. BSNL Chief General Manager Anil Jain said, “BSNL will launch 5G services the same day as their launch globally,”. BSNL has already been working together with international vendors like Nokia, Coriant and ZTE to build its 5G technology network in the country. The public telecom company is aiming to unveil its 5G consumer services starting 2020. 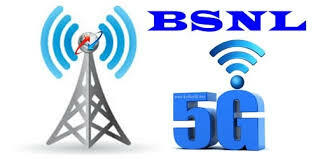 BSNL has already acquired the airwaves in the premium 700 Mhz band from the Department of Telecom (DoT) to launch its 5G services along with 4G and VoLTE services. The DoT panel recently claimed that the airwaves in the 700 Mhz can be made immediately available to run the 5G services in the country. Bsnl ka tower ae nahi hai kaha se 5 g milega bakaush. It's very foolish to hear from u . Sad. Nobody has a good word about bsnl. Ha HA HA BHAI KYO FOOL BANA RAHE HO PAHLE APANA 3G HI CHALA LO 5G TO DOOR KI BAAT HAI. Govt Company BSNL .Why the Govt not giving help to BSNL .When it will compete with private giants like Airtel,Vfone,Idea etc.Govt should help BSNL to come up in competition and earn profit. then you should go for 4G/5G......and more. Mazaak na kijiye.Maha galti se 28 Mar ko number port karwa diya with the assurance that multiple towers will come out in next 15 days. No network till date. Waiting for 90 days to port back. Eorst ecperience of life time. BSNL is Indian Govt a largest network in India but it does not allowed high speed internet, Voice clarity, fast leased lines. This is one of the biggest half Govt Telecom industry but not able to beat Idea, Airtel Vodafone, and other networks with all available facility and well equipped. Due to BSNL management and employees are not understand their duties and responsibilities. BSNL has more power, Good equipment and govt telecom authority than other good network but its not give us best services Like GIO. Main problem BSNL is Trade Unions, the perception of every employee of BSNL is even they not work nothing will happen,because there Jobs are secure by currant Labour Laws of country,Second is Obligation of BSNL is recruit Lady's employs - These Lady's work up to 05.00 PM, after that they go o home closing exchanges.Officers can't force them to work due to feed of criminal action will take place against them by lady employs and lady organisations. Naturally due to non attendance of switches or tower fault Network claps. Fact is who will open mouth against this issue he will facing criminal law action quickly by this lady staff with Police. Till this Lady's Employs Not removed from BSNL until this corporation BSNL not survive. Political will is requir for it. Otherwise this very good Navratan BSNL will going to way of AIR INDIA.